Pixar’s plans for the future are often shrouded in mystery. However, Entertainment Weekly reports some exciting details out of CinemaCon 2012 regarding Pixar’s upcoming slate, including a previously unannounced production! Speaking to theatre owners at Disney’s panel, John Lasseter announced Toy Story 3 director Lee Unkrich’s new project based on Dia de los Muertos (Day of the Dead), to be released sometime in 2015. Currently, little is known about the storyline, but the Mexican holiday provides some rich source material to experiment with. Furthermore, the humorously titled The Untitled Pixar Movie About Dinosaurs was renamed The Good Dinosaur. The film was also dated for May 30, 2014, following a release date conflict with Disney’s Frozen. Directed by Bob Peterson, best known as the voice of Dug in Up, the movie depicts a world where dinosaurs never went extinct. The Untitled Pixar Movie that Takes You Inside the Mind, helmed by Monsters, Inc. and Up director Pete Docter, also received a new release date, June 19, 2015, about a year later than previously announced. No title or any additional details were revealed, although the premise continues to intrigue. 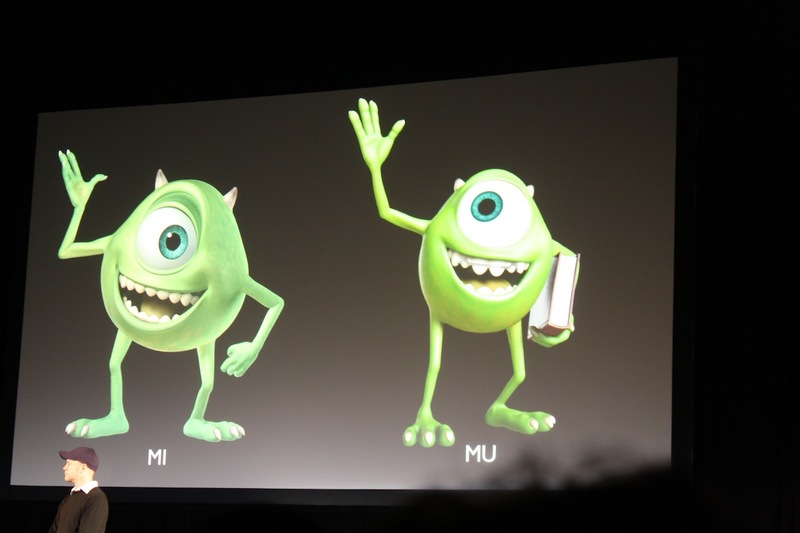 Finally, a teaser trailer for Monsters University was screened to attendees of the panel, depicting the rivalry between young Mike and Sulley through a college prank. Expect it to be attached to Brave, which opens on June 22, 2012. Monsters University will make its way into theaters on June 21, 2013. What are your thoughts on Pixar’s upcoming films? Thanks to our friends at The Pixar Times, we now have our first look at the updated character designs of the iconic Monsters duo. Director Dan Scanlon showed side-by-side images of Mike and Sulley from the original film and its prequel at yesterday’s D23 Expo. The scare team gets a facelift, you might say, as Monsters University takes audiences back to college. Some notable changes seen in the 18-year old Mike Wazowski include shorter horns and nails, smoother skin and a retainer! 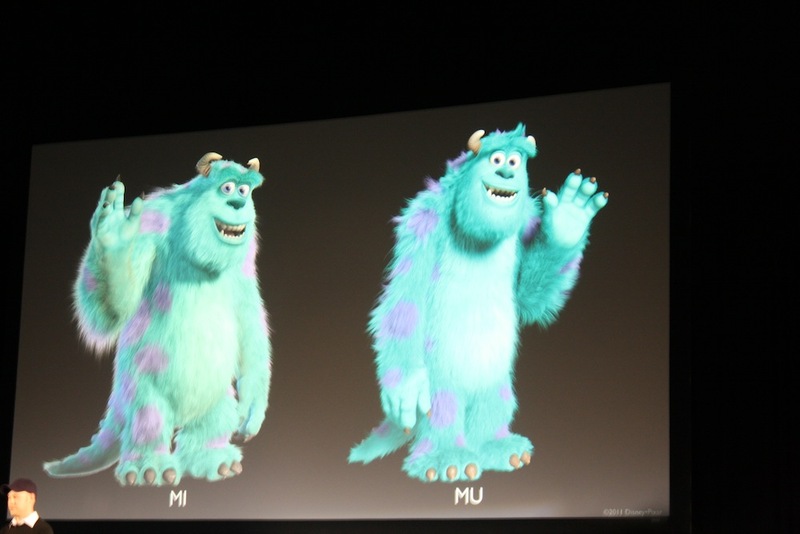 Sulley is noticeably taller and skinnier with better posture and less exaggerated horns. One aspect that stays constant from Inc. to University is the inclusion of Billy Crystal and John Goodman who will both reprise their starring roles in the upcoming film. Also confirmed at D23 is the return of Steve Buscemi as Randall Boggs. New additions to the cast will include Dave Foley (Flik in A Bug’s Life) and Pete Sohn (Emile in Ratatouille) as yet-to-be revealed characters. For more images, please visit The Pixar Times’ gallery. Monsters University scares its way into theaters on June 21, 2013. Thoughts on the new designs? Pixar’s other highly anticipated sequel, Monsters University, has a brand new logo, synopsis and release date! Heading to college on June 21, 2013, the prequel to Monsters, Inc. takes viewers to a time before Mike and Sulley were best friends. Billy Crystal and John Goodman reprise their roles. Directed by Dan Scanlon, produced by Kori Rae. Monsters University hits theatres almost 12 years after the original. According to Box Office Mojo, Monsters University has been pushed back to June 21, 2013, half a year after its scheduled premiere. This news may come as a shock to fans looking forward to the prequel, especially after a large amount of news recently broke on the subject. Previously titled Monsters, Inc. 2, the film had a November 2, 2012 release on the calendar. Just last week, it was revealed that rising star Dan Scanlon would step up as director. Mater and the Ghostlight (also directed by Scanlon) is one of my favorite movie-based short films, so I think the second installment in the Monsters franchise is in good hands— even if it may take a little longer. In turn, the studio also indirectly confirmed the plot of Pixar’s 2012 sequel. I’ll admit that when I first heard the rumors, I was pretty skeptical, but the idea sounds absolutely fantastic. Reports leaked in January that Monsters, Inc. 2 would not be a sequel, but instead a prequel to the popular 2001 film. Monsters University reportedly follows Mike and Sulley way back in their college days. The word is that the inseparable duo had quite the rivalry at the University of Fear. Monsters University is set to premiere exactly 11 years after the original, on November 2, 2012. Could the long rumored, (relatively) recently confirmed follow-up to Monsters, Inc. actually be a prequel? According to rumors stemming from the Dutch animation blog, Animatie, that may just be the case. Although the project’s core creative team has yet to be confirmed, a couple of plot details are currently being claimed. Monsters, Inc. 2 is set to be released exactly 11 years after its 2001 predecessor, on November 2nd, 2012. What do you think about this rumor? Good idea? True or false? Monsters, Inc. 2 Pushed Up Two Weeks! This move is in direct response to Breaking Dawn Part II, the final Twilight film, which was recently set to debut on November 16th, 2012 — the same day that Pixar’s sequel was supposed to open. Much needed breathing room has now been restored! Let’s be honest, as popular as Monsters, Inc. is/was, its sequel would have certainly suffered against the rabid Edward vs. Jacob fans. Although Twilight movies have big opening booms and then tend to flounder, Disney/Pixar is well aware that a non #1 opening for ‘Monsters’ is not worth risking. And the world is at balance. Then again, a monster fight at the box-office could be interesting… Maybe not! Observation: The original Monsters, Inc. was released on November 2nd, 2001 so the sequel will premiere exactly 11 years later!